I no longer eat jalebi. There was a time when they used to form the dreamiest of my breakfast ideas. Well not only breakfast, I could eat them anytime of the day, and eat a whole lot of them. But something changed in me. Not necessarily on a level that impacts your choices by changing a memory. As a matter of fact, I still have the most fondest of my memories around this childhood fascination of mine. Ever since I was big enough to stand on my Papa’s scooter, I used to accompany him every day to the sweets shop. My parents and grandparents had always been particular about my diet and so we only bought milk from the best place in the town. Doesn’t matter if that required a certain number of miles added to the daily scooter mileage. The reason I always went with him was because I loved the idea of doing some work with my Papa and also for the scenery. And the scenery was beautiful. Standing there with my Papa in the long queue, I used to look at the different people that came to the shop. They were mostly elderly gentlemen, “like my Babaji”, as I preferred calling them seeing they were in the bracket of my Grandfather’s age. I so wished they could bring their children or their grandchildren with them but they never did. Being the only child there, I used to get those ‘How cute’ and ‘How adorable’ nods and greetings from everyone, something which is almost an obligation for people when looking at a small kid. But Hey, I didn’t know it then and I absolutely loved to bask in the glory of me being worshiped as the Krishna-Kanhaiya of those numerous stories Grandma used to tell me. 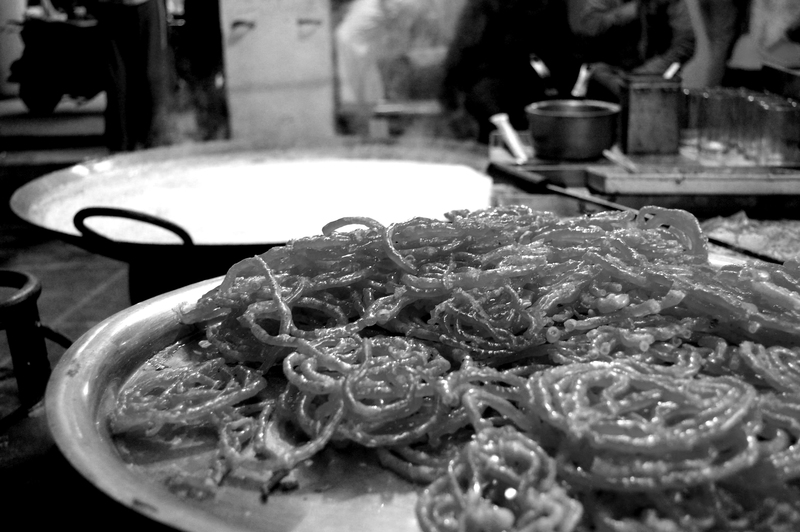 But the prime reason why I sacrificed my sleep everyday, not that I really loved to sleep much, was to go there everyday and watch the guy making fresh jalebis on his hot wok. I just couldn’t help get away with the magical mechanism of his. At first, I had a simple wok in front of me, then some oil in it, then again a magical potion wrapped in a cloth. And just like a wizard, he used to move his hand around the oil, all the while pushing the cloth down and Voila, the best thing in the world popped up into that wok. That sound right there when those jalebis touched the hot oil was the greatest piece of music for me. 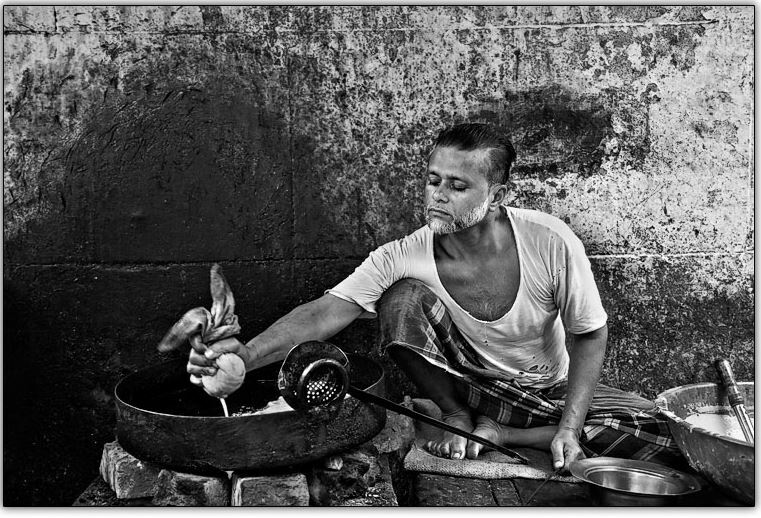 When the white things would become true jalebis, he used to pour them into another wok, which my dad had told me contained sugar. But the sugar I used to see at home was white and hard but here it was like water. Another trick to play with my mind. Much as I loved those jalebis when he put them on the shelf, I did not ask my Papa to buy me some on all days. Maybe I knew or was taught that it wasn’t right to. But seeing my love for them, my Papa himself used to order some, mostly on Sundays when the whole family could together sit at ease and nosh upon them. At other times, he used to read my face and know that this particular day, I loved them more than most days and would ask me, “Jalebi Khaoge?” as I used to hug his leg and say Yes. Then, when it was our time for milk, he would order them for us and I could finally let go the milk can to hold on to better things in life.